endothelin formation, endothelin receptors and vascular actionsEndothelin (ET-1) is a 21 amino acid peptide that is produced by the vascular endothelium from a 39 amino acid precursor, big ET-1, through the actions of an endothelin converting enzyme (ECE) found on the endothelial cell membrane. ET-1 formation and release are stimulated by angiotensin II (AII), antidiuretic hormone (ADH), thrombin, cytokines, reactive oxygen species, and shearing forces acting on the vascular endothelium. ET-1 release is inhibited by prostacyclin and atrial natriuretic peptide as well as by nitric oxide. Once ET-1 is released by the endothelial cell, it binds to receptors on the target tissue (e.g., adjacent vascular smooth muscle). There are two basic types of ET-1 receptors: ETA and ETB. Both of these receptors are coupled to a Gq-protein and the formation of IP3. Increased IP3 causes calcium release by the sarcoplasmic reticulum, which causes smooth muscle contraction. In blood vessels, the ETA receptor is dominant under normal conditions in terms of ET-1 effects on contraction. 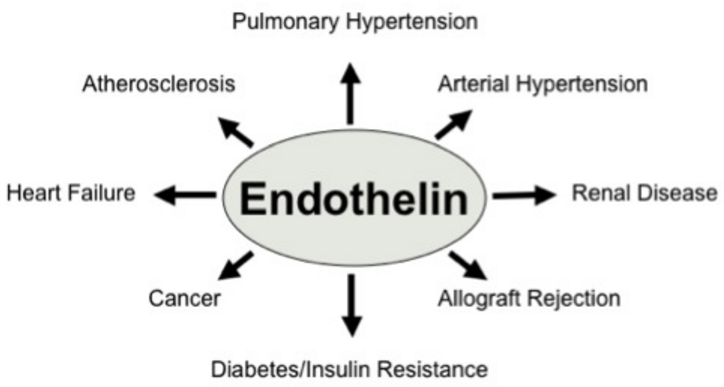 In addition to ETA and ETB receptors on the smooth muscle, ETB receptors are also found on the endothelium. 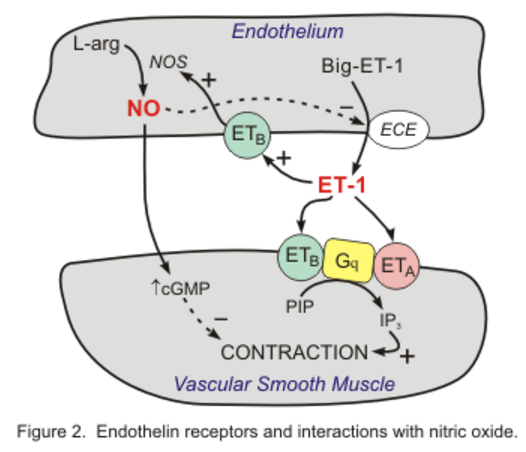 When ET-1 binds to these endothelial ETB receptors, the formation of nitric oxide (NO) is stimulated. 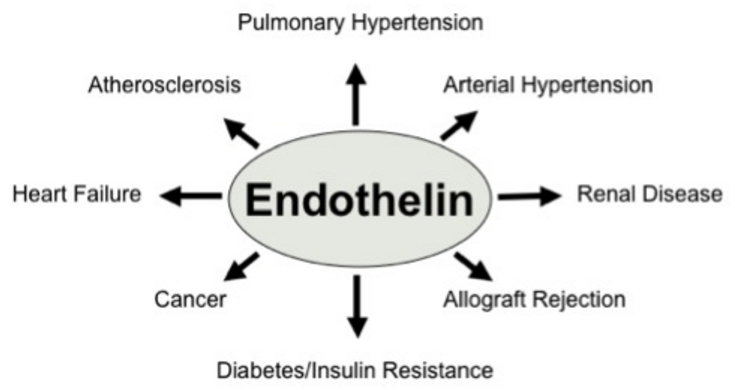 In the absence of smooth muscle endothelin receptor stimulation, this NO causes vasodilation. 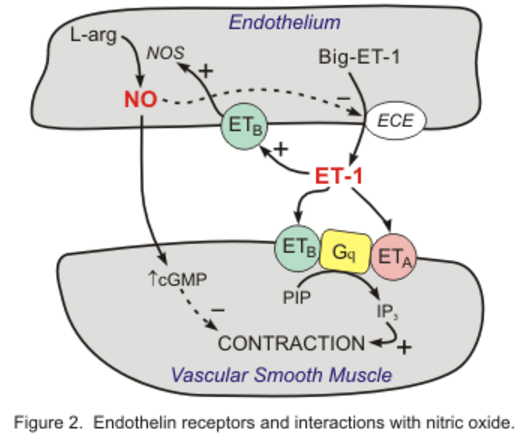 ET-1 receptors in the heart are also linked to the Gq-protein and IP3 signal transduction pathway (click here for details). Therefore, ET-1 in the heart causes release of calcium by the sarcoplasmic reticulum, which increases contractility and heart rate. 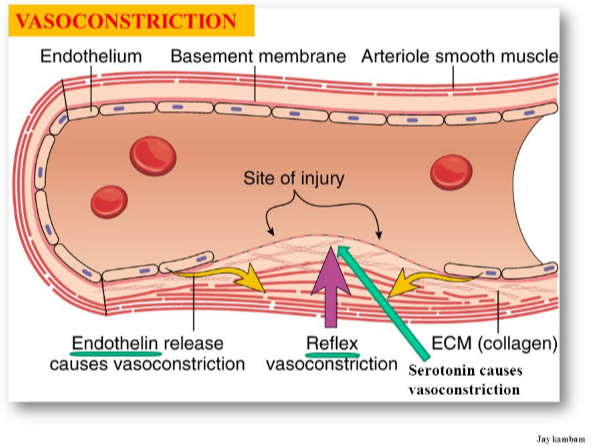 The distribution of endothelial and smooth muscle receptors helps to explain the phenomenon that systemic administration of ET-1 causes transient vasodilation (initial endothelial ETB activation) and hypotension, followed by prolong vasoconstriction and hypertension (smooth muscle ETA and ETB activation). Direct effects of ET-1 on the heart are modified by baroreceptor reflexes in response to changes in arterial pressure following systemic administration of ET-1. ET-1 has a number of other actions besides vasoconstriction and cardiac stimulation that can indirectly affect cardiovascular function. ET-1 stimulates aldosterone secretion, decreases renal blood flow and glomerular filtration rate, and releases atrial natriuretic peptide (ANP). Because of its powerful vasoconstrictor properties, and its effects on intracellular calcium, ET-1 has been implicated in the pathogenesis of hypertension, coronary vasospasm, and heart failure. In the latter condition, ET-1 is released by the failing myocardium where it can contribute to calcium overload and hypertrophy. Endothelin receptor antagonists have been shown to decrease mortality and improve hemodynamics in experimental models of heart failure. A number of studies suggest a role for ET-1 in pulmonary hypertension, as well as in systemic hypertension. A non-selective ET-1 receptor antagonist (bosentan) is currently used in the treatment of pulmonary hypertension. Figure 2: Disease processes in which endothelin-1 / endothelin ETA-receptor signaling has been demonstrated to play a role. 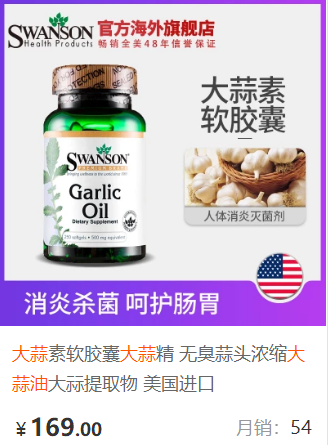 Due to its growth-promoting and pro-inflammatory properties contributes to chronic diseases with an inflammatory component such as atherosclerosis, hypertensive end-organ injury, renal failure, and heart failure. Figure reproduced from Can J Physiol Pharmacol 2008; 86: 485-498.